Fran had chronic fatigue for what felt like forever. Nothing she tried helped—until she came to Whitaker Wellness and her doctor recommended ATP Fuel. After taking this supplement twice a day, her energy levels have been boosted tremendously and she feels better than she has in years. There’s a reason ATP Fuel is a favorite of Whitaker Wellness patients. It contains NT Factor, a blend of phospholipids that support and repair the all-important cellular membranes and facilitate delivery of therapeutic compounds into the cells. In addition to boosting mitochondrial ATP production and reducing chronic fatigue, ATP Fuel also counters oxidative stress and promotes optimal cellular function. That said, ATP Fuel isn’t our only treatment for chronic fatigue, or fatigue in general—and there are many reasons why you may be feeling run down. Let’s take a closer look. Depression and anxiety sap your energy and motivation. Cancer, heart disease, heart failure, COPD, and autoimmune disorders can make you tired and listless. Mononucleosis, hepatitis, Lyme disease, and other infections are often accompanied by unrelenting fatigue. Insomnia is obviously linked with sleepiness, and as discussed above, chronic fatigue syndrome is pretty self-explanatory. As you can see, fatigue has many underlying causes, but unless there’s an identifiable culprit, it may be hard to pin down. Therefore, I’m going to focus on common but overlooked factors that, once addressed, can restore energy and vitality and dramatically improve quality of life. John’s chief complaint when he arrived at Whitaker Wellness was low energy. “My get-up-and-go,” he explained, “has got up and gone.” It didn’t take long to get to the bottom of it. Fatigue was a side effect of three of his five medications. Once we swapped them for safe, natural alternatives, his energy rebounded. Lethargy, fatigue, and drowsiness are common side effects of many medications. First and foremost are central nervous system (CNS) depressants, which include opiate painkillers; benzodiazepine tranquilizers/anti-anxiety drugs; sleeping pills, which are notorious for next-day “hangover” effects; and antipsychotic drugs, formerly reserved for serious mental illness but now routinely used for depression. Antihistamines, found in hundreds of over-the-counter medications for allergies, colds, insomnia, motion sickness, and nausea, also depress the CNS. These drugs are particularly risky for older people, as they also increase the risk of falls and memory impairment. Other popular but problematic meds include antidepressants, blood pressure meds (ACE inhibitors, beta-blockers, and diuretics), and acid-reducing proton pump inhibitors. Especially concerning are cholesterol-lowering statins, which are recommended for half of men and women over age 40. I can’t tell you how many patients and subscribers have complained to me about statin-related fatigue and muscle weakness, which is due to the drugs’ suppression of coenzyme Q10. Although an estimated 20 percent of statin users suffer with these side effects, most doctors ignore the obvious and remain slavishly devoted to these harmful medications. B12 deficiency is a well-known cause of fatigue that is especially common in older people, who have a harder time extracting this vitamin from food. Shortages of both B12 and folic acid can lead to a disorder of the red blood cells called megaloblastic anemia, which is characterized by fatigue, weakness, and mental fog. Iron deficiency is an even more frequent cause of anemia. This mineral is required for the production of hemoglobin, which carries oxygen on the red blood cells. Although iron-deficiency anemia is most common among very young children and women of childbearing age, it’s surprisingly prevalent in older people, affecting 12-17 percent of men and women age 65 and older. Vitamin D deficiencies are also linked with tiredness. In a recent study, increasing blood levels from an average of 20 to 52 ng/mL resulted in significant improvements in physical, mental, and emotional fatigue. Maintaining optimal levels of all these important nutrients can be easily achieved with therapeutic doses of nutritional supplements. Judy’s primary health concern was her increasing weight and her lack of energy and motivation to do anything about it. When I suggested testing her thyroid hormones, she told me her primary care doctor had assured her they were normal. We checked them anyway, found she had subclinical hyperthyroidism (normal T4 but mildly elevated TSH), and treated her with low-dose natural thyroid. When she returned to the clinic three months later, she was full of energy, exercising regularly, and 12 pounds lighter. Every physician knows low thyroid function causes fatigue. Nevertheless, many are reluctant to treat subclinical hypothyroidism, which affects an estimated one in five women over age 60. In my opinion, everyone with signs and symptoms of low thyroid deserves a trial of natural thyroid. Declines in testosterone, estrogen, progesterone, and adrenal hormones also drain energy and vitality, and bioidentical hormone replacement therapy (HRT) often yields significant improvements. Whitaker Wellness patient Carrie E. recently wrote, “For five long years, I struggled with exhaustion. I thought I was sleeping fine—eight hours each night—but I was tired 24/7, which left me emotional, stressed, and unable to deal with anything that came my way. I would wake up in the morning already exhausted, and I felt like I was in a constant fog. 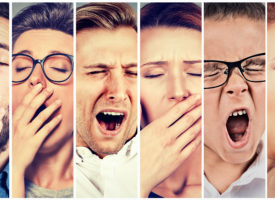 Sleep apnea goes undiagnosed in approximately 80 percent of sufferers, putting them at risk not only of exhaustion but also hypertension, weight gain, diabetes, and heart disease. If you’re inexplicably tired and especially if you snore, get tested. Liz’s afternoon slumps ended when she replaced her lunchtime chips, fries, and sandwiches with salad and lean protein, which eliminated the blood sugar swings that left her tired and listless. Kent marvels at how much his weight loss has improved his energy and endurance. Hal credits morning exercise with giving him a boost that lasts all day. Harry’s meditation sessions calm his mind and increase his energy. Louise’s 30-minute “power naps” keep her physically and mentally charged. No single solution works for everyone, but I hope that at least one of these suggestions will help restore your vim and vigor and help you say goodbye to fatigue for good. Request blood tests to rule out deficiencies of vitamins B12 and D, folic acid, and iron and supplement accordingly. Everyone should take a potent daily multivitamin but only take iron if recommended by your doctor. To order ATP Fuel, call 800-810-6655. If you’d like to learn more about the clinic’s treatments for any of the health challenges mentioned in this blog, visit whitakerwellness.com or call 800-488-1500. Please note: Extreme fatigue or sudden overwhelming tiredness should be evaluated by a physician.